Light a grill. In a small saucepan, cover the apricots with the water and bring to a boil. Remove from the heat and let stand for 3 minutes, then drain. Rub the pork with olive oil and season with salt and pepper. Grill over a moderately hot fire, turning occasionally, until cooked through, about 10 minutes. Let rest for 5 minutes, then cut each piece into 3 slices. Meanwhile, in a large skillet, melt the butter. Add the curry powder and cook over moderate heat, stirring, until fragrant, about 2 minutes. Add the cabbage, apricots and rosemary, season with salt and pepper and cook over high heat, stirring until the cabbage is wilted, about 5 minutes. 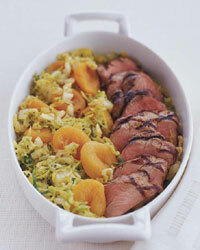 Transfer the curried cabbage and apricots to plates, top with the grilled pork slices and serve.